ShareNode provides no information on their website about who owns or runs the business. The ShareNode website domain (“sharenode.com”) was first registered back in 2006. The domain registration was last updated in August 2018. Stephen Chiang is listed as the owner, through a PO Box address in the US state of California. 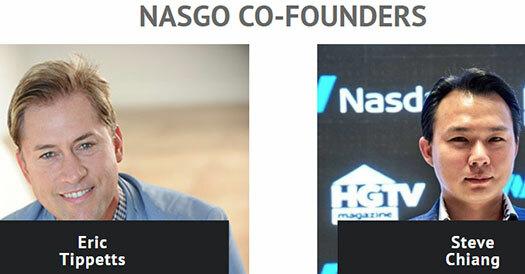 Further research reveals Chiang (who also goes by “Steve Chiang” and “Steve Jiang”) and Eric Tippetts cited as a co-founders of Nasgo. On the ShareNode website the company advises it is “powered by Nasgo”. A press-release dated October 3rd names James Hardy (right) as co-founder of ShareNode. Eric Tippets has been doing the rounds of the MLM training circuit for a number of years, primarily through his Rocket Recruitment app. At least for a number of years, Nasgo appears to be Tippet’s first MLM venture as an executive. Steve Chiang also appears to have a marketing background but is much more secretive about it. The first organization I created quickly became a 1000 member force using each others skill sets to succeed and create the template for future success. That organization became the fastest growing organization in a US company and with those 1000 employees quickly became the #1 distributorship within a three month period. Due to the generic nature of the name, I wasn’t able to specifically pin down Chiang’s MLM past. James Hardy heads up eVantage Financial, some sort of insurance based income opportunity. Alexa statistics for the eVantage Financial website suggest it has long-since collapsed. Read on for a full review of the ShareNode MLM opportunity. Nasgo markets NSG tokens, through which the company claims any company can launch a blockchain, digital assets and/or token instantly. With NASGO, you can tokenize your company with no coding required. Everything in Tokenize Basic and Plus, plus a “preferred listing on ShareNode Business Directory”. ShareNode affiliates receive commissions when they sell Nasgo’s “Tokenize” packages. Commissions are paid out in SNG, NSG and bitcoin. As previously mentioned, NSG is a token launched by Nasgo. SNG is a token launched within ShareNode. ShareNode uses bitcoin to pay quoted $USD commissions. ShareNode pays commissions on NASGO Tokenize packages via a unilevel compensation structure. Note that ShareNode fails to provide leader and Ambassador qualification criteria in their compensation marketing materials. After signing up, ShareNode affiliates are able to directly invest in SNP tokens. ShareNode set the internal value of SNP tokens, with affiliates able to receive a ROI by cashing out through ShareNode’s internal exchange. ShareNode affiliate membership is tied to investment in a minimum of 1000 SNP tokens. As per the ShareNode marketing slide on the right, this information is not shared with the public. As such I was unable to pin down what ShareNode are currently selling 1000 SNP tokens for. This is not how a legitimate MLM company operates. Nasgo is basically marketed as a blockchain platform. In a nutshell they want business to pay them thousands of dollars to use their NSG and SNP tokens. As I write this neither NSG or SNP are publicly tradeable, meaning the value and buying/selling of the tokens is centrally controlled through Nasgo and ShareNode. As opposed to cryptocurrency, this reduces both tokens to Ponzi points. ShareNode and Nasgo can set the price of SNP and NSG to whatever they want. Naturally, to keep their affiliate investors happy, the company is likely to only ever increase the value. Investment in NSG tokens allows an affiliate to park the points with ShareNode, in exchange for daily returns in SNP. This is effectively how a ShareNode affiliate grows their investment balance until they want to cash out. Cashing out sees ShareNode honor ROI withdrawal requests with invested funds. ROI revenue is represented as coming out of companies who sign up with Nasgo Tokenize Packages, however there’s no provided auditing of this. Not withstanding if there aren’t any companies signing up, ShareNode represents they’ll still honor ROI withdrawal requests. yours to allocate where and when you want to. Unless they’re withholding that selling is only possible if another SNP bagholder buys your tokens, the ROI withdrawal money has to come from somewhere. That leaves new investment from affiliates (who invest in NSG, bitcoin or ethereum), closing the Ponzi cycle loop. I’d also be very surprised if ShareNode weren’t paying referral commissions on SNP investment, but I wasn’t able to confirm if they were. In any event it should be painfully obvious that NSG and SNP tokens are securities. ShareNode affiliates are investing in SNP on the expectation of a passive return, which is interwoven with SNG tokens. ShareNode rewarding affiliates with bonus SNP if they opt to reinvest commissions into SNP demonstrates that, despite appearing as two companies, in reality ShareNode and Nasgo are controlled by the same people; namely Stephen Chiang, Eric Tippets and James Hardy. All three appear to be based out of California in the US. Furthermore ShareNode and Nasgo are being actively promoted across the US. Alexa also cites the US as the largest source of traffic to both the Nasgo website (34%). For the ShareNode website the US comes in at second (38%), behind South Korea at 53%. To operate legally in the US, ShareNode and Nasgo have to register their respective tokens with the SEC. At the time of publication neither ShareNode, Nasgo, Stephen Chiang, Eric Tippets or James Hardy are registered with the SEC. This means that on a base level, ShareNode and Nasgo are committing securities fraud. But Oz, what about all the companies investing in Tokenize packages? NASGO was launched in early 2018 by serial entrepreneurs Eric Tippetts and Stephen Jiang and markets its services to small-to-medium enterprises through a network of 4,000 representatives. It wasn’t until ShareNode took off in mid-August that Nasgo’s reversed an otherwise certain collapse. What we learn from this is outside of SNP investment from ShareNode affiliates (primarily in South Korea and the US), not much is going on inside Nasgo. If Nasgo’s instant token platform was viable, there’d have been no need to launch ShareNode to prop it up. As it stands ShareNode and Nasgo are one securities fraud cease and desist from shutting down. South Korea has emerged as a hotbed for cryptocurrency fraud over the past few years (MLM and non-MLM). In the US ShareNode and Nasgo are just another fraudulent MLM cryptocurrency opportunity to throw on the pile. 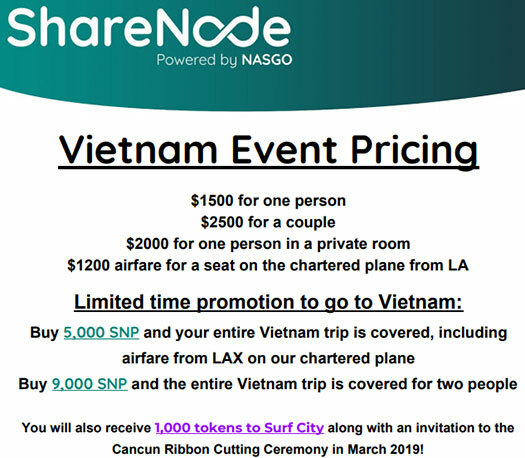 True to form, ShareNode are also gearing up to spread into Vietnam, another notable hotbed for MLM cryptocurrency fraud (BitConeeeeeeeeeeeect!). The only real money entering the companies is affiliate investment in SNP, which costs ShareNode and Nasgo little to nothing to generate. The bitcoin and ethereum invested in SNP, sans bitcoin is paid out in commissions, is squirreled away by the three founders. When ShareNode and Nasgo collapse or are shut down, SNP and NSG tokens evaporate and sorry for your loss. Alternatively SNP and NSG are dumped on some dodgy public exchanges, although that seems unlikely given how hard Nasgo is pushing its token ecosystem. Anyway even if does, nobody outside of ShareNode is interested in SNP tokens, so it’s still a sorry for your loss scenario. The only winners here are those generating SNP and NSG tokens. A few early adopters will cash out through the internal exchange, but ultimately the majority of ShareNode affiliates will take a loss.